JMC, through its authorized importer and distributor, Global Autodistribution, Inc. (GAI) is showcasing its vision for the modern jeepney through the N700 Modern Jeepney. 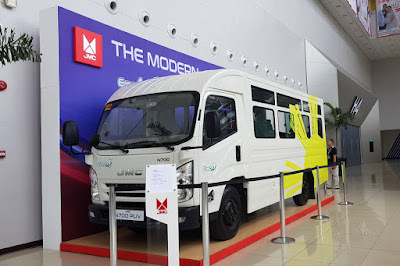 Based off the JMC 4-wheeler light truck, it was shown to the public for the first time at the Philippine Bus & Truck 2018 Exhibit at the SMX Convention Center. “We developed the JMC N700 Modern Jeepney with the small-medium scale transport operators in mind who want to comply with the changeover towards safer and more environment-friendly transportation but in more economical terms. In compliance, the N700 Modern Jeepneys come equipped as a standard offer with the Anti-lock Brake System to ensure vehicle stability and overall driver control and its engines are Euro IV compliant,” said Lyndon Go, President of Global Autodistribution, Inc.
As part of GAI’s commitment to be a reliable business partner, the company took the initiative to make their offerings not just safer and greener, but more financially manageable and sustainable. “Now, that is where our business instincts came into play as we looked into how our N700 could sustainably answer the real needs of our clients. The answer was in creating more seating; more seating more bang for the investment. 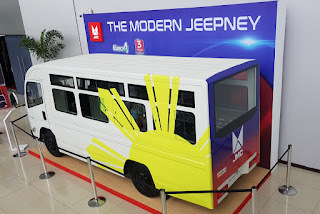 With the N700’s long wheelbase, a gross vehicle weight of 4,365-kg and a payload capacity of 2,500-kg, we developed a “modern jeepney” design that gave the transport operator double the seating capacity over his traditional jeepney increasing it to 30 seats. Now, that’s an investment that will could likely generate more income makes sense now and open the floodgates, so to speak,” added Go. The JMC N700 Modern Jeepney together with their other Euro IV-compliant vehicle offerings—the N700 4-wheel truck, N700 Double Cab, N720, and N820 6-wheeler trucks are all primed to be GAI’s driving force in its commitment to deliver a safer, greener, and more affordable mobility provider to businesses in the Philippines. And as a testament to their confidence, JMC is now offering an extensive 3-year, 80,000-kilometer warranty through its various dealerships located nationwide.